For decades, government jobs have been a major source of upward mobility for recent immigrants, racial and ethnic minorities and other historically underrepresented groups. 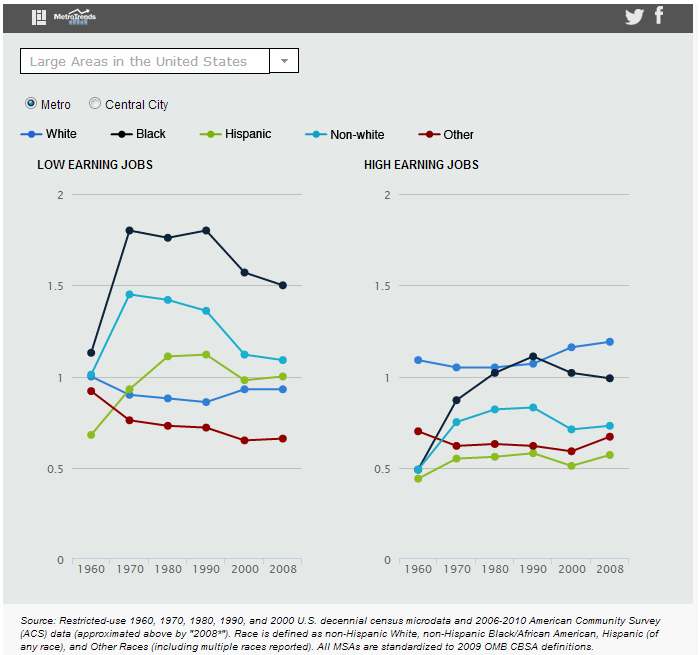 Census Bureau researcher Todd Gardner recently analyzed decades’ worth of non-public Census microdata to examine how well local government workforces have kept pace with evolving immigration patterns and the legal end of workplace discrimination. His analysis shows that while whites continue to be overrepresented among high-earning local government jobs (and underrepresented in low-earning jobs), local government workforces have become more diversified over the past five decades. More than two-thirds (69.7%) of high-wage local-government jobs were held by whites, though they make up only 57.8% of the population, according to the most recent American Community Service data. Blacks have long been overrepresented in low-paying local-government jobs, but now are represented proportionately in high-earning public-sector jobs in most major metros. Hispanics are proportionately represented in low-earning jobs but underrepresented in high-earning ones; other groups are underrepresented in both job tiers. Chart of the Week: Do firefighters or musicians have richer parents?